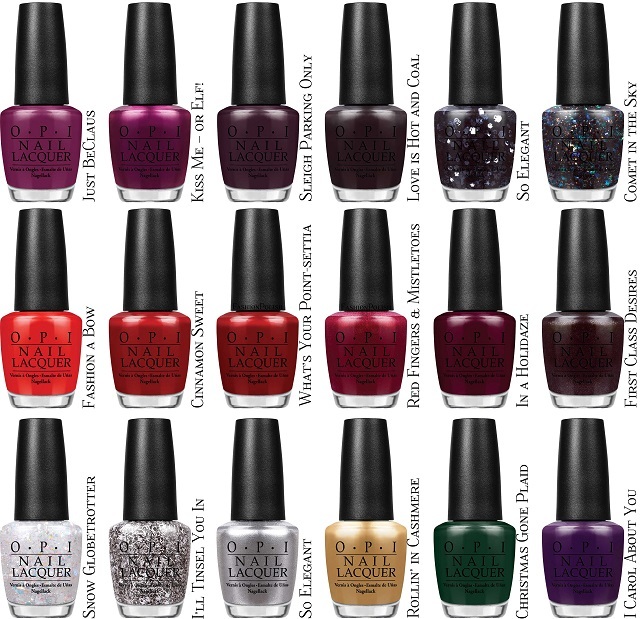 Fashion Polish: OPI Gwen Goes Holiday: 19 New Shades and Nail Effects! OPI Gwen Goes Holiday: 19 New Shades and Nail Effects! Don’t Speak Pure 18K Gold Top Coat features OPI’s exclusive ProWide™ Brush for the ultimate in application. This limited edition promotion will be available beginning October 2014 at professional salons, including Beauty Brands, beautybrands.com, Beauty First, Chatters, Dillard’s, Pure Beauty, Regis, Trade Secret, ULTA and ulta.com, for $30.00 ($37.50 CAN) suggested retail. OPI launches six limited edition GelColor lacquers and seasonal GelColor kits featuring the line’s signature high-shine formula that lasts for weeks, in new popular hues inspired by No Doubt singer/songwriter and L.A.M.B. designer Gwen Stefani. The seasonal collection includes an assortment of jewel tones in maroon, burgundy, royal purple, forest green, and gray-brown, as well as gold, silver and copper hues. The Gwen Stefani Holiday GelColor collection includes the following shades (also available in nail lacquer formulas): Just BeClaus, Kiss Me – or Elf, I Carol About You, Christmas Gone Plaid, In a Holidaze and Love is Hot and Coal. In addition to these six new shades, OPI releases several GelColor kits for the holidays including: Celebrate Color GelColor Kit, Unfrost My Heart GelColor Trio #1, Rollin’ in Cashmere GelColor Trio #2, Put a Brush on it!, Winter Escape Mani/Pedi GelColor Kit, and GelColor Femme Fatales. Celebrate Color GelColor Kit features six Gwen Stefani-inspired lacquers – Rollin’ in Cashmere, Love is Hot and Coal, I Carol About You, Kiss Me – or Elf!, Sleigh Parking Only, and Christmas Gone Plaid, as well as Expert Touch Removal Wipes and a chic gold carrying case. Unfrost My Heart GelColor Trio #1 includes three metallic and glitter shades from the Gwen Stefani holiday line: Unfrost My Heart, I’ll Tinsel You In, and So Elegant; Rollin’ in Cashmere GelColor Trio #2 includes three gold and glitter hues also from the Gwen Stefani holiday collection: Rollin’ in Cashmere, Snow Globetrotter, and Comet in the Sky. Put a Brush on It! features three Gwen Stefani holiday shades in GelColor formula – Rollin’ in Cashmere, Unfrost My Heart, and In True Stefani Fashion – along with one limited edition shade only found in this kit, A Real Show Copper. These four shades are packaged with a nail art brush, ideal for creating holiday-inspired designs. Winter Escape Mani/Pedi GelColor Kit offers everything needed for fingers and toes, combining Gwen Stefani holiday shades Rollin’ in Cashmere and Kiss Me – or Elf! with popular OPI classics Pink Flamenco, Dutch Tulips, OPI on Collins Ave., and You Don’t Know Jacques!. This kit also includes Manicure/Pedicure by OPI Tropical Citrus Mask, Scrub, and Massage, as well as Expert Touch Removal Wipes and tabletop instruction booklets. Back by popular demand for the holidays only, GelColor Femme Fatales includes six signature GelColor shades in bestselling red and pink hues: OPI on Collins Ave., Dutch Tulips, Color So Hot it Berns, The Thrill of Brazil, OPI Red, and Got the Blues for Red. Limited edition Gwen Stefani Holiday GelColor shades are available beginning October 2014. GelColor is currently available in over 100 iconic OPI shades. GelColor is an in-salon, professional product only. Individual shades are priced at $14.95 ($18.95 CAN). Celebrate Color GelColor Kit and GelColor Femme Fatales are priced at $79.95 ($99.95 CAN) each; Unfrost My Heart GelColor Trio #1 and Rollin’ in Cashmere GelColor Trio #2 are $34.95 each ($42.50 CAN); Put a Brush On It! is $57.95 ($69.95 CAN); Winter Escape Mani/Pedi GelColor Kit is $89.95 ($112.50 CAN). All GelColor products are available for professional use only. OPI is guaranteed only when purchased through authorized professional beauty outlets and prestige stores, not from a drugstore, supermarket, mass outlet or other unauthorized source. For more information, please call 800-341-9999 or visit www.opi.com. Follow OPI on Twitter and Instagram @OPI_PRODUCTS and become a Facebookfan! A singer since childhood, Gwen has fronted the band No Doubt for the past 22 years. During this time she has achieved worldwide success as a performer, songwriter and recording artist selling over 30 million albums worldwide. No Doubt's five genre-blending albums have showcased Gwen's adept songwriting and poignant lyrics with number one hits like "Don't Speak", "Just A Girl", and "Hey Baby" along with many others. After the double-platinum retrospective Singles Collection, featuring the hit "It's My Life," Gwen released two highly successful solo albums. Love.Angel.Music.Baby was released in 2004 and The Sweet Escape was released in 2006. In 2009, after a nearly five-year hiatus, No Doubt completed a 50-plus city North American tour performing for more than 750,000 fans that summer and in 2012 No Doubt released Push and Shove which debuted at #3 on the Billboard Top 200 chart. Gwen was recently named a coach for the upcoming seventh season of NBC's Emmy Award-winning musical competition series 'The Voice'. In addition to her singing-songwriting career, Gwen is widely recognized as a trendsetter and accomplished designer within the fashion industry. Gwen's first fashion line L.A.M.B., launched in 2003, is a luxurious collection of clothing, handbags and shoes, defined by Gwen's innate sense of style which often features a playful juxtaposition between classic Hollywood movie star glamour and more modern street influences. In 2005, Gwen launched cult brand Harajuku Lovers, a playful and pop art inspired line that reflects Gwen's love of Japanese culture and fashion. Gwen's most recent fashion projects include DWP (Design With Purpose) a casual yet luxurious ready-to-wear line of custom washed fabrics and hand painted techniques that launched in February 2014 and Gx - a line of affordably priced fashion forward accessories that launched in March 2014.